The report covers the analysis and forecast of the Biometric Sensors market on global as well as regional level. The study provides historic data of 2016 along with the forecast for the period between 2017 and 2025 based on revenue (US$ Mn). The study provides a detailed view of the biometric sensors market, by segmenting it based on by application, by type, by end use and regional demand. A biometric sensor is a kind of transducer that transforms biometric treat such as face, voice, fingerprints and others of a person into an electrical signal. Generally, the biometric sensor reads temperature, pressure, light, electrical capacity, speed and other types of energies. Physical traits of the human body are merged with digital technology in order to impart biometric security which is done with the help of biometric sensors. Physical traits like fingerprints face metrics and vein structures in hands are often used to develop desired templates. Biometric sensors are compact in design and also light in weight and can be installed in devices very easily. Thus, it is expected that the biometric sensors market will achieve significant growth oppurtunities during the forecast period of 2016-2025. Regional segmentation includes the current and forecast demand for North America, Europe, Asia Pacific, and rest of the world. The segmentation also includes by types, by end useand applications in all regions. The competitive profiling of the key players in the global biometric sensors market across five broad geographic regions is included in the study. These include different business strategies adopted by the leading players and their recent developments, as in the field of security verticals. A comprehensive analysis of the market dynamics that is inclusive of market drivers, restraints, and opportunities is part of the report. Additionally, the report includes potential opportunities in the biometric sensors market at the global and regional levels. Market dynamics are the factors which impact the market growth, so their analysis helps understand the ongoing trends of the global market. Therefore, the report provides the forecast of the global market for the period from 2016 to 2025, along with offering an inclusive study of the biometric sensors market. The report provides the size of the biometric sensorsmarket in 2016 and the forecast for the next nine years up to 2025. The size of the global biometric sensors marketis provided in terms of revenue. Market revenue is defined in US$ Mn. The market dynamics prevalent in North America, Europe, Asia Pacific and rest of the world have been taken into account in estimating the growth of the global market. Market estimates for this study have been based on revenue being derived through regional pricing trends. Demand for biometric sensorshas been derived by analyzing the global and regional demand for biometric sensorsin each application for its respective functions. Thebiometric sensorsmarket has been analyzed based on expected demand.Forecasts have been based on expected demand from biometric sensorsapplications. We have used the bottom-up approach to estimate the global revenue of the biometric sensors market, split into regions. Based on, application, by end use, and type, we have summed up the individual revenues from all the regions to achieve the global revenue for biometric sensors. The application split of the market has been derived using a bottom-up approach for each regional market separately, with the global application segment split being an integration of regional estimates.Companies were considered for the market share analysis, based on their innovation and applicationand revenue generation. In the absence of specific data related to the sales of biometric sensorsseveral privately held companies, calculated assumptions have been made in view of the company’s penetration and regional presence across all applications. The report covers a detailed competitive outlook that includes the market share and company profiles of key players operating in the global market. Key players profiled in the report include Safran, CrossMatch Technologies, Inc., Fulcrum Biometrics, Infenion Technologies AG, Suprema Inc., ZKTeco Inc., NEC Corporation, Precise Biometrics Ab, 3M among others. Biometric sensor is the modern version of security system. These types of sensors are a crucial part of the identity technology. A biometric sensor is a kind of transducer that transforms biometric treat such as face, voice, fingerprints and others of a person into an electrical signal. Generally, the biometric sensor reads temperature, pressure, light, electrical capacity, speed and other types of energies. Physical traits of the human body are merged with digital technology in order to impart biometric security which is done with the help of biometric sensors. Physical traits such as fingerprints face metrics and vein structures in hands are often used to develop desired templates. Identification and fast verification are some of the key accredit of biometric sensors. Biometric sensors are compact in design and also light in weight and can be installed in devices very easily.Moreover, the increase in security concerns and also the rise in demand for smart gadgets has augmented the market growth for biometric sensors. The recent innovation in security or privacy system is an example of biometric sensors. Thus, biometric sensors being the future of security system it is expected to enhance the market growth during the forecast period of 2016-2025. Biometric sensors offer wide range of benefits in the privacy sector. These benefits may include better safety and security for the consumers. Factors such as facial scan, fingerprint scan, voice scan and hand scan are expected to achieve positive growth for the biometric sensors market during the forecast period. Moreover, increasing use of mobile phones and online money transactions leads to a huge market growth opportunity for biometric sensors in the financial zone. Along with this in automotive industry the rise in adoption of biometric lock system in cars and technological advancement are expected to enhance the market growth of biometric sensors over the forecast period. Further down, there are also some demerits with the biometric sensors market. Firstly, the lack of well-trained staff may not handle the biometric facilities properly and may degrade the market growth for biometric sensors. And secondly, limited application and implementation of biometric sensors in various geographical regions may hinder the biometric sensors market growth. Major applications of biometric sensors technology covered in report are finger scan, facial scan, voice scan, iris scan, hand scan, vein scan and others. 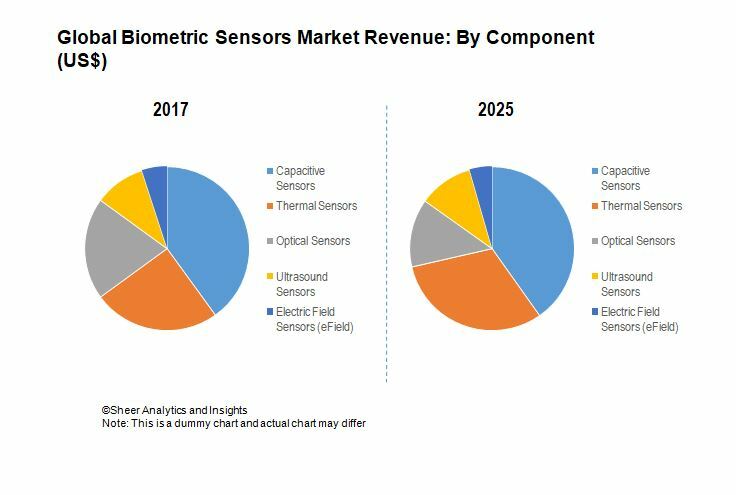 The biometric sensors market in thereport is segmented by type which includes capacitive sensors, thermal sensors, optical sensors, ultrasound sensors and electric field sensors. The report has been further segmented by end use which includes commercial centres and buildings, banking, financial services sector, consumer electronics, medical and research labs, defence and security and others. The global biometric sensors market has been moreover segmented geographically into North America, Europe, Asia-Pacific, and rest of the world. Biometric sensor is one of a new kind of technology and is expected to grow at a high rate with the increase in security sector across the globe. Biometric sensors technology will be one of the major trends to gain traction in this market in the upcoming years.Technological advancement in security system causes the rise in demand of this biometric sensor technology in various sectors such as commercial centres, banking, automotive, defence and security and others. In recent years, the rise in demand of privacy and security would certainly augment the market growth of biometric sensors. Some of the major players in the biometric sensors market are include Safran, CrossMatch Technologies, Inc., Fulcrum Biometrics, Infenion Technologies AG, Suprema Inc., ZKTeco Inc., NEC Corporation, Precise Biometrics Ab, 3Mamong others.